350 Bay Area is made up of a dynamic team of volunteers who not only help do the work, but lead the initiatives as well. 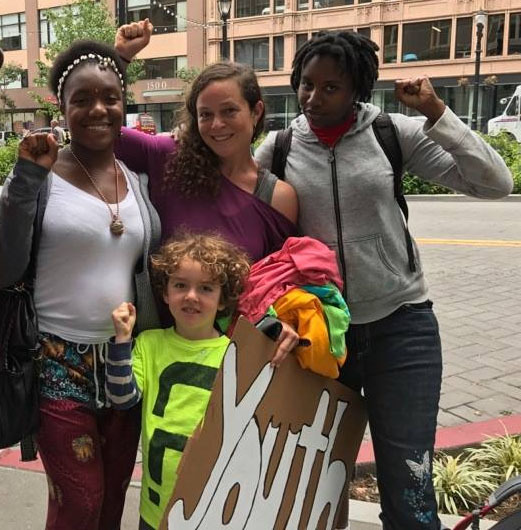 One of these awesome activists is Carolyn (center of photo); read about her work with youth and passions below. What inspired/inspires you to work for action on climate? My son was born just after Fukushima exploded. On maternity leave, wanting reassurance that we were going to be ok, I started reading “science” news articles on my phone. Soon the immense love and protectiveness I felt for my newborn collided with the stark realities I was reading about our climate emergency. I had already worked with middle and high school age youth for years (since I was that age! )– but when I came back from maternity leave, it was with a new determination to support youth in calling out and fighting back against this threat to all of our lives, and especially theirs. What do you work on at 350 Bay Area? I work on a program called Youth Vs. Apocalypse- a climate justice activism program for middle and highs school students. My main job is to support students in taking meaningful and powerful action to fight for their climate rights. I do presentations in schools around the Bay Area, support ongoing student activists clubs on a weekly basis at a number of schools, bring together youth coalitions on specific campaigns, and organize training and support for student led actions. How have you been supporting the Youth v Gov efforts? In this case, there were a number of students in SF who have been active in other youth led actions in the past, who decided to plan an action around this. I have simply been an as-needed support person, doing things like making messaging suggestions, providing media training and press lists, and helping connect other local activists with the youth activities. It was great to learn that the youth had chosen to do a street mural, a tool we had shared at Zero Hour this summer and the RISE climate justice action in September. The youth who participated in those actions feel comfortable and empowered to use street murals as part of their activism. I try to offer just what is needed, not to step in too much with my own agenda– it really should be led by youth. As young people, we believe in the importance of protecting our planet for future generations. We find the lack of climate action our government is taking to be appalling and we are grateful for the incredible work these 21 amazing young people are doing. 350 Bay Area has been amazingly welcoming and supportive of youth leadership. Rather than imposing views on what young people “should” be learning, they have supported youth in taking action now, getting their voices into the discussion, and being bold. What’s your favorite 350 Bay Area story? Probably the time when we brought 200 sixth graders with handmade drums and flags to the EPA listening session on the “repeal” of the Clean Power Plan. Specifically, it was approaching a formal press conference on the steps of city hall, with the hundreds of drumming and chanting 11 and 12 year olds, and watching how the whole place got silent as the kids approached, accidentally marched past the press conference, and then returned, to completely steal the show with their heartfelt speeches on the podium. Which climate solution are you most excited about and why? I am excited by the idea that the climate disaster will force us to find new ways to recognize and reject the destructiveness, racism, and misogyny and mistreatment of youth that have been part of our society for a long time. I am excited by the possibility that we can mitigate and survive this disaster by finding deeper forms of allyship and community. I have worked in youth development programs in Oakland since graduating from SF State in 2003. Besides working at 350 Bay Area, I am the mom of a 4 and a 7 year old, and teach poetry in an after school program in East Oakland. I am grateful not only to my supportive husband and two little kids, but also to my parents, who are lifelong activists for a better world, to my sister who taught me most of what I know about how to organize politically, and to my whole large Bay Area extended family of activists and musicians. Since you asked, I do also appreciate my pets, a dog, a cat and, insanely, 10 chickens, and the wild food forest that is our backyard.